◎ The Xi Jinping administration is mustering public opinion to pressure Chinese officials into supporting the constitutional changes. 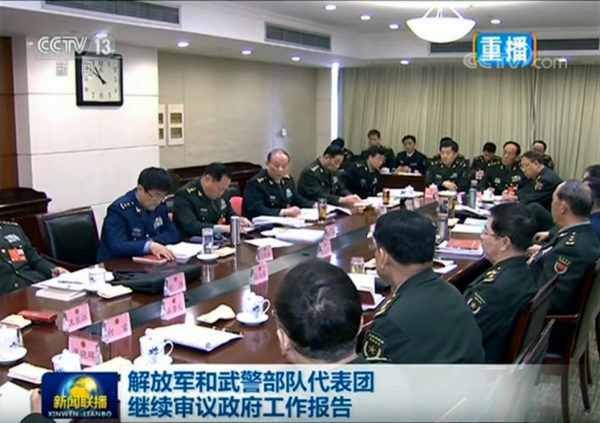 On March 7, the military delegation to the 13th National People’s Congress (NPC) session publicly endorsed the amendments to the state constitution that were proposed at the Central Committee’s Second Plenum. On March 8, NPC delegates at the second meeting of the 13th NPC’s first session reviewed and deliberated a draft of the proposed constitutional amendments. The Xi Jinping administration is mustering public opinion to pressure Chinese officials into supporting the constitutional changes. The amendments include the abolishing of term limits for the Chinese presidency and vice presidency, a change that made waves internationally. The very public and overwhelming support of the constitutional amendments by officials and the military indicates that Xi is in a precarious position even though appearances suggest otherwise. Indeed, he appears to have no choice but to use heavy-handed propaganda methods to create the impression that the Party is in “one voice” on the amendment issue while simultaneously silencing inner Party opposition. We discuss in detail why Xi removed the presidential limits in earlier articles.